The Deschutes River heads in South Central Oregon and flows nearly 300 miles due north to enter the Columbia River near The Dalles. It drains all of the east side of the Cascade Mountain Range. Although this drainage is located in the arid rain shadow of the Cascades, the large area encompassed produces a river with average annual flows of over 4,000 cubic feet per second (cfs) at the mouth. One hundred miles upstream from the mouth, Pelton Dam creates 400-foot-deep Lake Billy Chinook. Agreements with the power company keep water fluctuations to a minimum. This tail-water effectively turns the next 60 miles of the Deschutes into an enormous spring creek. The lower one hundred miles of the Deschutes is one of the most prolific trout streams in the western United States. Seventy miles are open to angling year-round. In this unique river, wild endemic desert rainbow trout rise to myriad hatches in riffles and back eddies mirroring green alders and brown basalt cliffs. These distinctive fish are affectionately called Redsides and are linked to the desert Red Band Trout group. Rocky Mountain Whitefish add to the spectacular nymph fishing. An occasional native Bull Trout adds variety to your catch. The Deschutes River canyon is an oasis in the sagebrush covered desert. Bird life is concentrated here, attracted by the hatches that also feed the fish. Game animals come to water. The sun shines an average of three hundred days a year. The air is very pure and clear. In winter, the Deschutes often has warm mid-day sun which triggers hatches of tiny mayflies and great dry fly fishing. Early spring is a time of March Browns or Gray Wing Olives. Late spring and early summer brings on the world-famous Salmonfly hatch. The warm weather of mid-summer through October brings hatches of caddis, midges, mayflies and small stone flies. Steelhead are available nearly year-round, but mid-July through November is prime time when mint bright summer steelhead enter the river. These aggressive fish come readily to the surface and create one of the premier floating line steelhead fisheries in the world. The Deschutes River in Central Oregon drains on the east side of the Cascade Mountain Range. The cold green water provides a counterpoint in what is otherwise a stark and arid landscape. 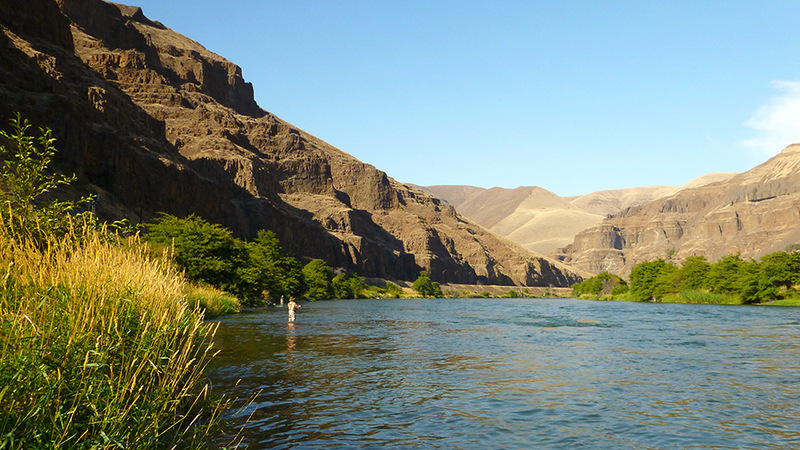 The lower 100 miles of the Deschutes River canyon averages 2,000 feet deep. The sparse vegetation allows the angler to observe nearly twenty-five million years of geologic history recorded in the steep canyon walls. Forty million years ago, Central Oregon was a semi-tropical, flat coastal plain which may have received 240 inches of rain fall per year. About 30 million years ago, the drifting Continental and Pacific plates collided. The Continental plate was pushed on top of the Pacific plate and the coastline started to gain elevation. This was the birth of both the Cascade and Coast Range mountains. This rising land mass changed the weather patterns and Central Oregon started to dry up. The collision of tectonic plates resulted in a tremendous fracturing of the earth's crust. Molten magma rose through these fissures and spread out across the surface of the land. This created the second largest basalt mantel on Earth. These basalt flows occurred intermittently for nearly 10 million years and cover over 10,000 square miles. Some layers are a million years apart. The Deschutes has been in its present position since the last flows. There is reason to believe that the river has been larger during some periods, especially at the end of the ice ages. The canyon seems too wide to have been cut by a river of its present size. There is evidence to suggest that humans have been companions to the Deschutes River for over 10,000 years. Any area with clean water and a substantial fish population is attractive. Primitive populations had no lasting impact on the scenery. However, since 1850 the human impact has been somewhat more imposing. Railroad building and livestock grazing have made major changes in the topography and vegetation. Present management is demanding that livestock are fenced from the riparian zone and in many places the stream side vegetation is recovering rapidly. Do not be mistaken that the Deschutes fishery was created by the tail water of the dams. The resident trout population certainly benefits from the rich stable flows created by the impoundments. The anadromous runs of steelhead and salmon, though still bodacious, have suffered from poor fish passage and the destruction of spawning habitat. The Deschutes trout fishery is regulated to sustain and enhance its populations of wild endemic fish. Only two trout per day between 10" and 13" may be harvested. Only barbless hooks on lures and flies are allowed. The use of bait is prohibited. No fishing from a floating device is allowed. 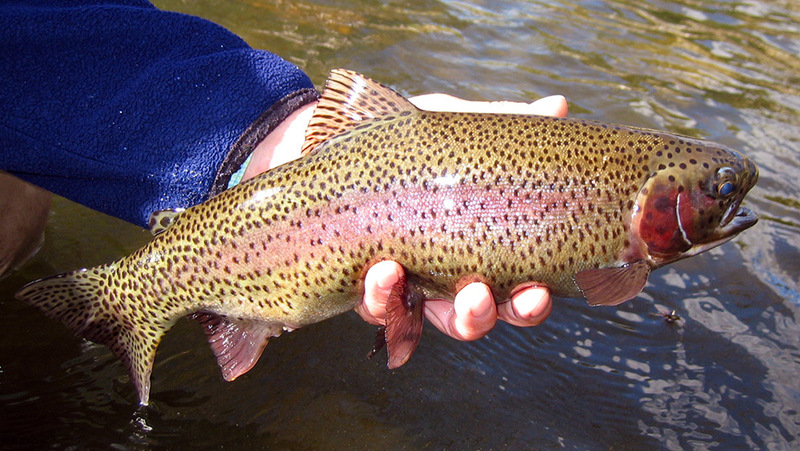 Deschutes Redsides are a unique subspecies of rainbow trout called "Desert Red Band Trout" or (Onchryncus Mykiss gairdneri). Adult fish are heavily built and often brightly colored. They are very strong and acrobatic when hooked. The Deschutes River contains every age group with the highest population made up of three to four-year-old specimens that range from 13" to 18" and weigh 1-1/2 to 3 pounds. Twenty-inch fish weigh over four pounds, and 23" fish weigh about six pounds. Many of these larger fish are four and five-year-olds which have not reached sexual maturity. They are incredibly strong and fast and can be extremely wary. Deschutes Redsides are primarily insectivorous with stone flies, caddis flies and mayflies making up the highest percentage of the diet for fish under four years old. Larger fish consume large amounts of insects, but also eat many crayfish. According to biological studies and our own observations, Redsides eat almost no fish except for an occasional sculpin. This dietary preference for insects gives the dry fly and nymph fisherman many opportunities. Redsides can be extremely selective feeders. Often when multiple hatches occur the fish will be keyed on only one stage of one insect. The Redsides tend to move with the hatches and concentrations of fish may be located in one water type in the morning and another water type in the afternoon. These factors can make angling very tactical. Hatches change from week to week in often prolific confusion. 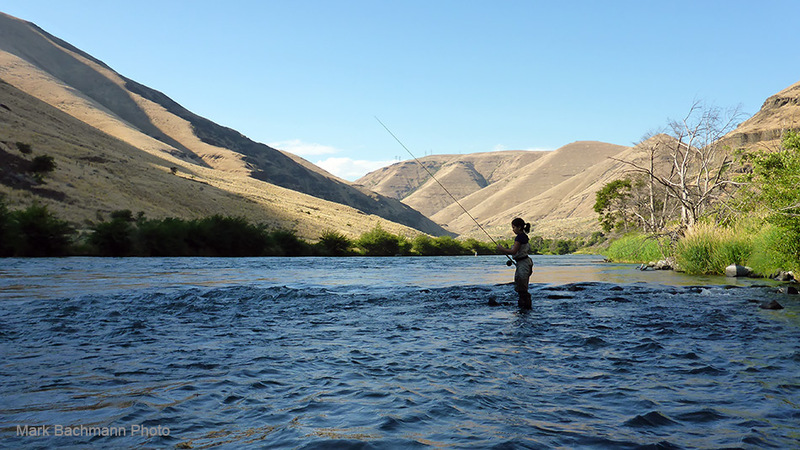 Since much of the Deschutes is open to the angler year-round, fly fishing opportunities exist all year. The weather during these months can be a mixed bag with cold mornings and evenings the rule. Angling pressure is at its lowest. Mid-day temperatures can exceed fifty degrees with major trout feeding activity occurring during warmer periods. During this period the river runs over 5,000 cfs most of the time. The water has averaged 3' - 5' visibility most years. The fishing has been good with the trout crowded into the softer flows along the banks were you can get at them. Many trout patrol back eddies and are highly visible. Feeding in the eddies occurs only during emergence of surprisingly prolific winter hatches. The most prominent and dependable hatch is the Winter Baetis may fly. These size eighteen blue wing olive or blue dun insects emerge most heavily at mid-day. Days that are overcast bring better hatches than days with clear skies. Several hatches of tiny black Winter Stone flies emerge from riffle water during the winter. Hatches of Chironomids may occur any time of day. These hatches are sporadic in most parts of the river, but can produce feeding activity and the angler should be prepared for them. The Deschutes contains a healthy population of Rocky Mountain Whitefish. The Whitefish and Steelhead spawn most heavily in February. Whitefish and Steelhead spawn contribute to the diet of the Redsides during this period. Most of this spawning occurs during low light hours. Fishing a Glo Bug deep during these periods when eggs are drifting can account for some really large Redsides hooked. The largest biomass of nymphs living on the bottom of the Deschutes River occurs before the major spring and summer hatch periods. Most Deschutes river aquatic insects have a one to three year life cycle. Therefore all of the insects that will hatch during the year are crawling on the bottom of the river during the winter. Many of these species have a daily behavioral drift cycle and may be available to the fish during certain periods each day. Nymph fishing in the winter can produce some of the largest trout of the year. March brings moderating but often blustery weather. Freezing weather is usually over by March and mid-day air temperature can exceed sixty degrees. Water temperatures are still cold and melting snows in the Cascades can make water levels raise and turn off-color. These water fluctuations can cause much catastrophic drift of nymphs and create feeding frenzies. Water levels can stay over 6,000 cfs. The winter stone hatches are over. Baetis hatches become more and more sporadic. Several species of caddis start to appear along the river with Hydropsyche and Glossosoma most prevalent. Lower reaches of the river below Maupin produce fairly dependable hatches of several species of Rhithrogena May flies. These hatches progress up river and can be found in the Warm Springs area in April. Behavioral drift cycles of May fly, caddis, and stone fly nymphs continue and nymph fishing continues to be productive. Whitefish are through spawning by the first week in March but Steelhead continue to spawn through April and scattered spawning Redsides produce some egg drift. There are also salmon fry emerging from the gravel. This is a great period for fishing fry and alevin patterns. For trout looking for more calories sculpin patterns fished deep on a sinking tip can produce big bites. The Central Oregon weather moderates by May and can start to get hot in June. Clear skies are the rule. Water temperatures climb into the low fifties and the level begins to stabilize at around 3,600 – 4,500 cfs. The blue dun Baetis species trickle off through May and are slowly replaced by blue wing olive species through June. Rhithrogena hatches occur sporadically during both months and Ephemerella May Flies start to appear in various parts of the river. Late May and early June herald the Giant Salmon Fly and Golden Stone hatches. This is also the period of peak Redside spawning. The rising water temperatures, huge hatches, and hungry Redsides returning from the redds spark voracious feeding activity. Because of this, angling traffic is also highest on some parts of the river and the angler must be in a frame of mind to put up with some competition. Every trout angler should witness the Salmon Fly hatch on the Deschutes. Giant two inch long insects cluster in the alders and stream side grasses. During the peak of emergence, the angler can study the metamorphosis of these huge insects in great detail. The often wily Redsides take up stations under the trees and along the banks to feast on the bounty of the river. The angler can encounter large trout feeding at close range. Short but precise casts in heavy cover are often the rule, but trout can also go on feeding binges in mid-river or at the breaking heads of riffles. In all situations drag has to be eliminated and controlled. A slight miss cue can instantly make even the most predictable feeder stop rising. The best casters always win. A fast loading, moderately fast action six weight rod is a real asset. Short, stout leaders are best for turning over the wind resistant flies. Several patterns are used to match the mood changes of both the fish and the insects. The visiting angler should plan day trips in the Warm Springs to Trout Creek section during this period and stay in a prearranged motel as the acquisition of camp sites is very competitive. Four day trips from Trout Creek to the upper end of the road access above Maupin is also an option that should be considered. A three day trip from Mack' Canyon to the Mouth can offer prolific caddis and may fly hatches and less sophisticated trout. Traffic in this lower canyon at this time of year is nearly non- existent. July brings the first really hot weather to the canyon. Air temperatures can reach into the nineties at mid-day and the sun reflecting from the imposing cliffs can turn the canyon into an oven. Insect and trout feeding activity start at daylight and can continue until noon in open water. The rising mid-day temperatures often force trout and humans into the shade. Back eddies, especially shaded ones, can produce dramatic sight fishing during all hours. Tiny flies and gossamer tippets are the rule. Prolific hatches of Caddis, Pale Morning Duns and Baetis May Flies bring trout to the surface to hang suspended in slow water areas. Foam lines in the vortexes of eddies trap thousands of emerging, crippled and dead insects. The trout which capitalize on this smorgasbord can be maddeningly selective and quiet observation before casting pays big dividends. A pair of high-resolution binoculars is essential. Revolving cross currents make for interesting line and leader control problems. Drag must be eliminated. Evening dry fly fishing can be frantic, with many species of caddis and may flies emerging and/or ovipositing at the same time. Water temperatures vary in the length of the river, with the coolest water near the dam. You can expect a five to seven-degree water temperature fluctuation during the daylight hours. At the dam, water temperatures usually are 54 degrees at daylight to 60 degrees at 3:00 PM, to 57 degrees at dark. Below Mack's Canyon water temperatures can range from 64 degrees at day light to, 70 degrees at 3:00 PM, to 68 degrees at dark. Surface activity in the lower canyon is confined to early and late. However the angler can put both trout and early summer steelhead on the beach by casting a weighted woolly bugger with a sinking tip line and short leader. Wading wet during mid-day is most comfortable. Your guide will also provide you with some of his top secret back eddy patterns. You should also carry these steelhead patterns. School starts in early September. 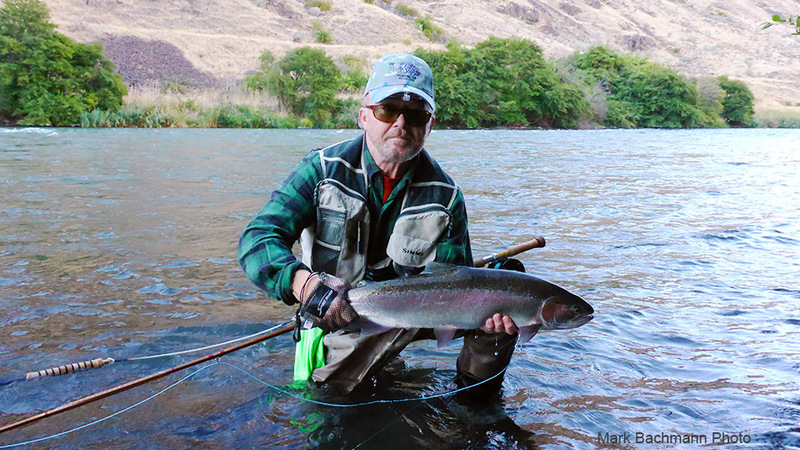 Most Deschutes anglers are concentrated in the lower river in search of steelhead. The water and air start to cool and the river is less appealing to rafters. The traffic on the upper river drops immediately. Trout become fatter and less cautious. This is the best time of year for a leisurely four or five day trip from Trout Creek to Harpum Flat. The colors in the canyon turn from brown and green to shades of amber. The nights turn cool and frost can greet the early morning angler. Water temperatures drop to the mid to low fifties. Levels remain stable. Trout feed heavily on caddis, small mayflies, stone fly nymphs and crayfish. 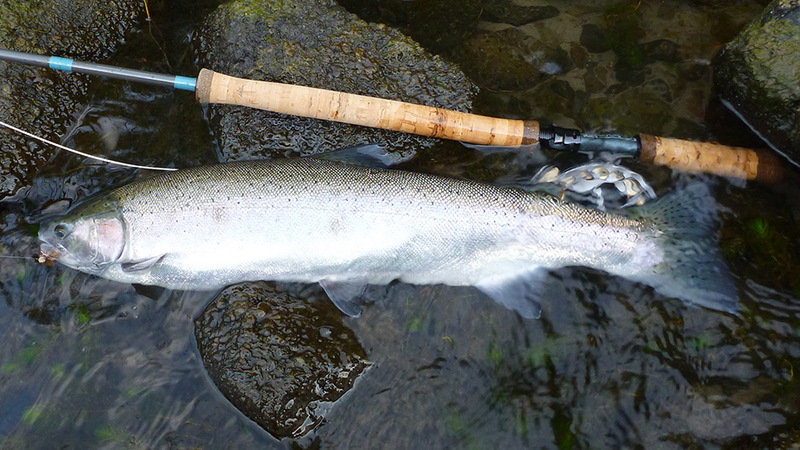 Steelhead are distributed throughout the river as a bonus. With the coming of cold weather to the river the metabolism of the Deschutes Redsides slows down. November steelheading overshadows the trout fishery and December brings weather that sends us to the warmer west slope of the Cascades and chromer steelhead in the Sandy River. However in recent years larger than average runs of steelhead have provided excellent fishing opportunities though February. 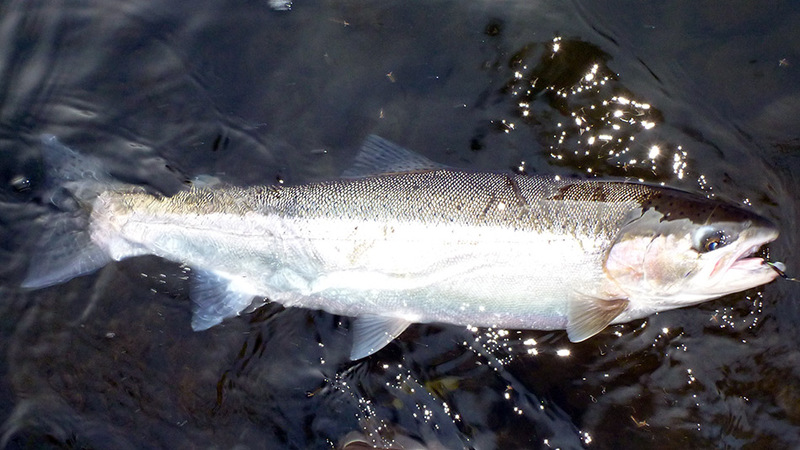 During the winter months the summer steelhead behave more like resident trout. Nymph fishing with small flies dead drifted near the bottom can produce double digit catches. 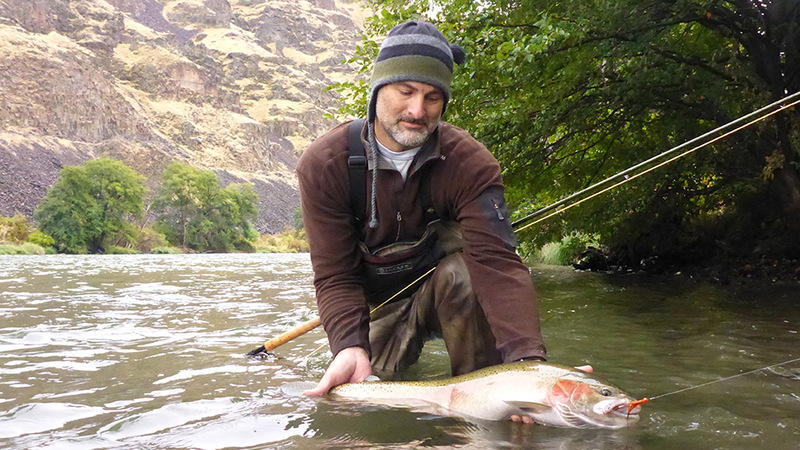 Since the topic of steelhead has been raised let us tell you about Deschutes Steelhead. The Deschutes is world famous as a steelhead fly fishing river. This is because its steelhead will actively come to the surface for a fly. Steelhead start entering the river in late June and bright fish can still be caught in late November. The run is made up of three distinct races: the hatchery run, and two distinct wild races called the "A" and "B" runs. The hatchery run can start in late June during high water years and as late as August during low water years. It is comprised of fish which have spent 22 to 30 months in the ocean and average 6 to 12 pounds. The "A" run enters the river in July and August and is made up of fish that have spent 14 to 22 months in the ocean and average from 3 ½ to 6 pounds. The "B" run enters the river from September through November and is comprised of fish which have spent 24 to 36 months in the ocean and weigh from 10 to 16 pounds. Larger fish can be encountered any time. During high water years, a lot of stray upper Columbia River stocks take up temporary residence in the Deschutes and add to its fishery. Only barbless hooks are allowed and all wild fish must be returned to the river. 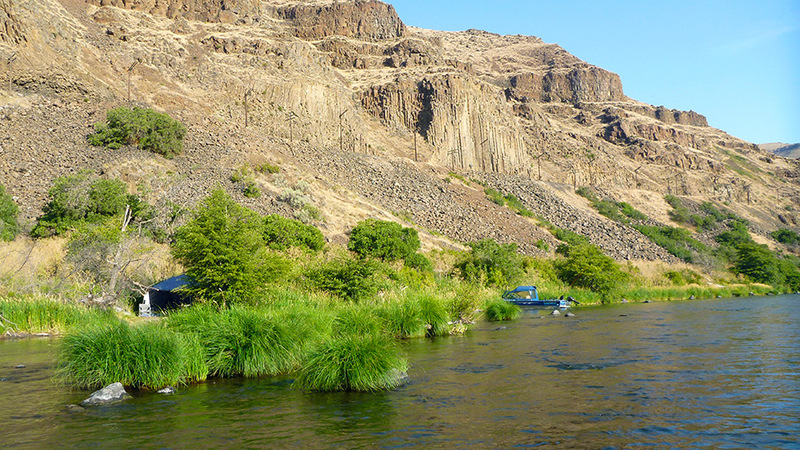 The Deschutes maintains a unique location as the most southern of mid-Columbia River tributaries. Its water flows and fall temperatures are the most predictable. Its north/south alignment keeps late fall water temperatures in the range that allow steelhead enough energy to rise to the surface for a well-presented fly. The size and topography of the river provide an ideal setting for the traditional greased line angler. Although many diverse angling methods will take Deschutes summer steelhead, floating fly lines and a traditional wet fly swing is accepted as one of the productive approaches. Most floating line techniques work best when the water is shaded by the canyon walls or by cloud cover. The angler usually begins at the head of a long run and fishes all the way through to the tail-out. Aggressive wading and fly casting may be required to cover the most productive water. 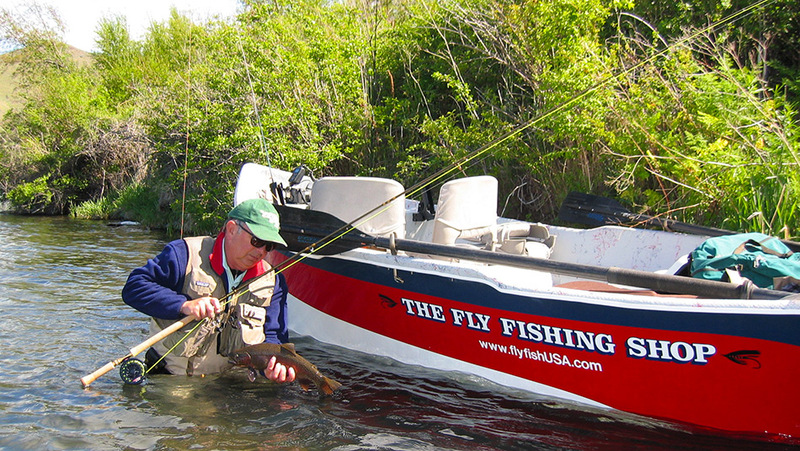 The fly is presented downstream across the current and allowed to swing on a tight line toward the angler’s shore. A series of mends may be employed to control the speed and depth of the fly. Often two flies are fished on a cast or a single fly may be riffle-hitched. Waking flies are often employed in the same cast with a wet fly. Fly speed is very important. Many hair wing wet fly patterns take Deschutes steelhead. However dark patterns in sizes four or six are proven to be most productive over the widest range of water and light conditions. The favored colors are black or purple with a touch of chartreuse, orange or pink.